Bubble 'spirit' levels on panorama and rotating tripod heads - a user guide. Bubble Levels on panorama heads - how to use. Tips & Tricks. Almost all panorama and 360 rotating tripod heads have some type of built-in spirit level or 'bubble level'. These are designed to allow the photographer to check that the equipment is correctly level before taking a sequence of photographs which will later be stitched to form a continuous panorama strip or 360 degree interactive 'VR Movie' - so the bubble level is effectively a feedback device - which lets you know IF the tripod head IS level. To set up your equipment to achieve a level starting position can be done by adjusting the tripod legs by slight increments until the bubble level confirms you have been successful. Many users (including all our photographers) use a '3 way leveller' which, by simply using thumbwheels can set the equipment level accurately and precisely time after time. Once you have set the level there is then no need to refer to it again, or do any re-adjustment during one sequence of images, in fact any re-adjustment to maintain the bubble 'dead centre' during a sequence of images for one panorama is far more likely to cause stitching errors than taking a sequence where the bubble appears to 'wander'. Ignore any bubble wobble. In short, set the head level for each panorama, then ignore the bubble level while taking the shots. Some variation in the position of the bubble occurs on every panorama head we have ever used, these bubble levels tend to be extremely accurate and sensitive, so will react to just the slightest of changes of increment. As an additional check, many users also fit a 'hot shoe' bubble to their camera when mounted to a panorama head, after all, even if the panorama head IS level it is a good idea to also have an easy way to check that you have also aligned the camera correctly! Set this ONCE, before you start to take your sequence of images for a panorama, then you know you have started from a level point but ignore any small variations during your sequence. Example: Built-in bubble level as used in most models of panorama head. 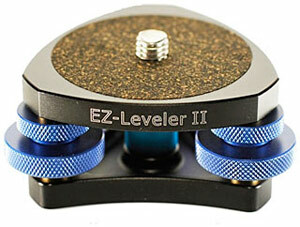 Example: EZ-Leveler II - a 3 way levelling device. 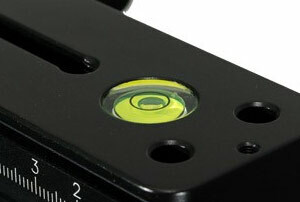 Example: Twin-axis 'hotshoe' bubble level mounted to camera. Prices and product specifications are subject to change without prior notice.The photographic product images on this web site may not exactly reflect the product you receive. Design revisions, updates, improvements and colour variations may exist E & OE. Red Door VR Limited may not be responsible for the content of external sites. Read more.